The first day of the Bates Australian Dressage Championships has come to an close. With nearly 250 horses from around Australia stabled in the Sydney International Equestrian Centre, the Centre is getting busier by the hour with riders, strappers, dressage enthusiasts and, of course, the obligatory canine pet. At 1pm the indoor arena was the host for the Intermediate II. Nineteen horses competed. Twelve horses from New South Wales, three from Victoria, one from Queensland, one from South Australia and one from close neighboring New Zealand. First place went to Heath Ryan and Regardez Moi from New South Wales with a score of 64.421. Second place was shared by Gitte Donvig from Victoria on Port Said 10 and Nadia Coghlan from New South Wales on Northern Campion – both with a score of 62.842. 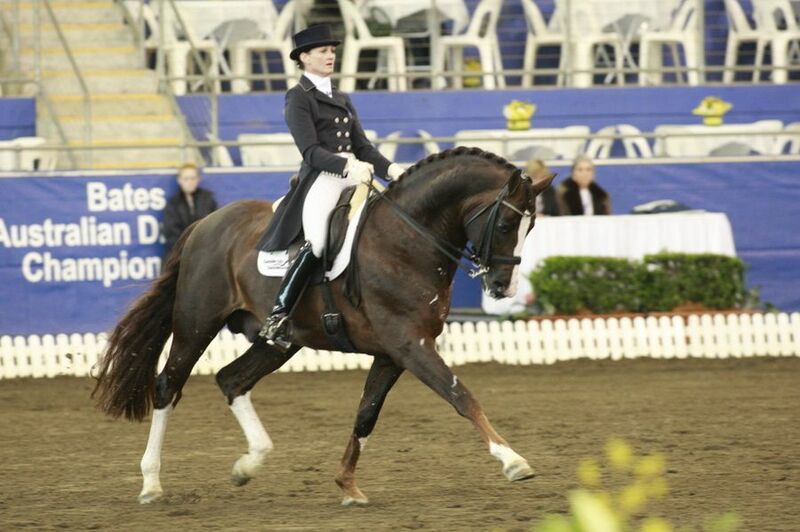 Third went to New South Wales rider Lesley-Anne Taylor on Weltklassse with a score of 61.842. Mary Hanna from Victoria had a great ride on Umbro which would have landed her in first place but for he disqualification on technical grounds. At the same time, the Prydes Easifeed YH 5yo Qualifier commenced outside. Twenty young horses competed in this class with fourteen from New South Wales, three from Queensland and one each from South Australia, Tasmania and the Australian Capital Territory. Queensland rider, Jessica Greelish and Rivendell Royal Jazz came first with 8.36, second place went to the New South Wales rider Katina Smith on Just Dance R with a score of 8.28 and third was New South Wales rider Lizzie Wilson Fellows on Lets Kiss N Tell with a 8.16. At 3pm, the Prydes Easifeed YH 6yo Qualifier took flight. Seven horses competed in this class with four from New South Wales and one from Western Australia, Queensland and Victoria. Teresa Grills and Ecclesbourne from NSW won with a score of 8.34, Daniella Dierks and Revelwood Donatello from NSW came a close second with 8.30, and Kathleen Guest and Pacific Eclipse, also from NSW followed in third with a score of 8.12. Tomorrow’s classes include two EJ & Co Advanced Tests, the Riders Shoppe Intermediate I and the Goldin Grand Prix CDN and CDI-W's. The trade village, showcasing a diverse range of ‘horsy’ products fills the area adjoining the main arena. By the end of the Championships, this will be the place to find a bargain.